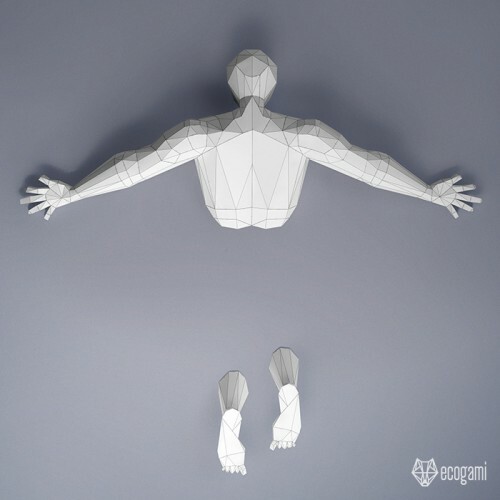 Make your own papercraft falling man with our printable PDF pattern! Just follow the instructions & you will be proud of your paper statue which falls in your wall. Isn’t it an original wall mount for your sweet home or even a gift for a unique objects lover? ► Print the template (choose between the pattern A3 & A4 according to the paper format you prefer. The final size is the same with the A3 or A4 pattern). The paper must be thick (200 / 300 GSM / grams per square meters). The one I use is 270 GSM & it is perfect for that kind of sculpture. You can print at home if you have a printer or, easier, go to the nearest Print shop, you could buy the paper & print there. ► Difficulty Level: Medium (this model is big, so it requires more time). The toes have small parts which require more precision.